France rejects Iran's denial that it is supplying weapons to Houthi rebels in Yemen. France on Thursday accused Iran of supplying weapons to Houthi rebels waging a three-year fight against a Saudi-led coalition in Yemen, rejecting Tehran’s denial that it was assisting the rebels. 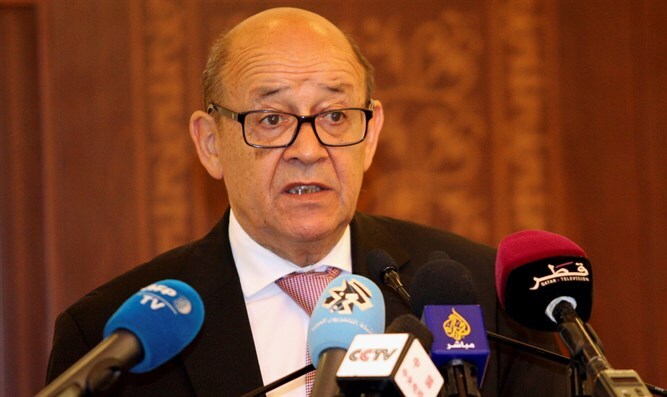 “There is a problem in Yemen: it is that the political process has not begun, that Saudi Arabia feels regularly attacked by the Houthis, who are themselves supplied with arms by Iran,” French Foreign Minister Jean-Yves Le Drian said, according to AFP. Iran has acknowledged it supports the Houthis’ cause in Yemen but has repeatedly denied arming them. Earlier this week, Iran's Revolutionary Guards denied Saudi Arabian accusations that Tehran provided Houthi rebels in Yemen with ballistic capabilities, a day after Saudi Arabia threatened retaliation against the Islamic Republic for a barrage of missiles fired by Houthi rebels from Yemen which resulted in the death of one person. Le Drian’s comments come just days before an official visit to France by Saudi Crown Prince Mohammed bin Salman. Le Drian’s bolstering of Riyadh’s claims could strain ties between Iran and France ahead of an expected visit by President Emmanuel Macron to Tehran in the coming months, the first by a French head of state or government since 1976, noted AFP. Recently, U.S. Ambassador Nikki Haley brought Security Council envoys to a U.S. military base in Washington to view missile parts that the U.S. calls evidence of Iran’s illicit transfer of prohibited missiles to the Houthis. Russia rejected the evidence presented by Haley. France has resisted international pressure to stop supplying weapons to Saudi Arabia and the United Arab Emirates, two of the main players in the coalition which supports Yemen’s pro-government forces. Le Drian insisted Thursday that the weapon sales complied with international law. “We have a very rigorous framework on weapon exports which we adhere to with great vigilance,” he was quoted as having said.